We love when that big brown truck pulls up! We all know somethin’ is comin’. True enough that most of the time it’s for my Lady, but ever once in a while we get lucky! Today was our lucky day! There was a box from BarkBox® just for us and it said somethin’ ’bout a garden party! Yea boy! I love me a good party! But wait! What’s a garden party? Last time I went in the garden and stole that cucumber I gots in trouble. WOOF! Here’s my Lady to tell ya ’bout our BarkBox and our fun party! My pups really are some good furbabies and I love to spoil them. I love giving them treats and toys, but most days it is a quick treat time and they more or less entertain themselves when we go out for our usual playtime. Then, inside they lay about or under my feet. 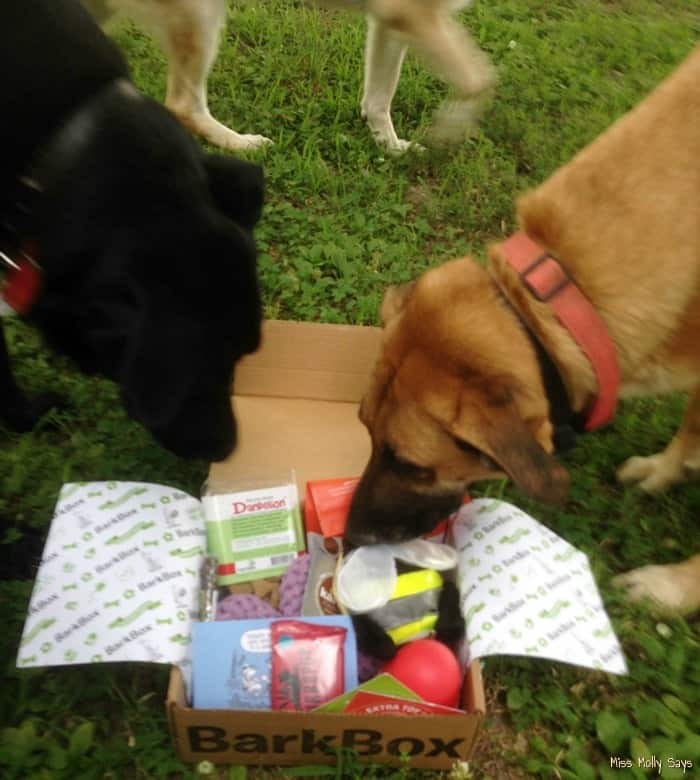 When they received a BarkBox subscription box full of wonderful goodies, it was the perfect time to spend some quality time with my dogs! It’s a great way to add enrichment to their lives and bond with them. The BarkBox was garden themed, with garden themed toys and treats. So, I told the pups we would have a garden party! This really confused Molly and caused that head tilt she gives me when she thinks I’ve lost my mind. She thought we were actually going to play in the “garden” and was probably hoping to steal more veggies. Anyway, our BarkBox included totally cute garden themed toys to play with like the Jax and Bones Rope Flower, a BumbleBee Silly Bums that crinkled and squeaked, and a bee-hive shaped Nina Ottosson Dog Pyramid. This was going to be so much fun! Molly must still be getting spiffied up because she is late to the party! I went ahead and opened the box for them and the pups were first in line to check out the goodies. Ozzy made short work of knowing what he wanted out of the goodies. He snatched the Jax and Bones Rope Flower and off he went. 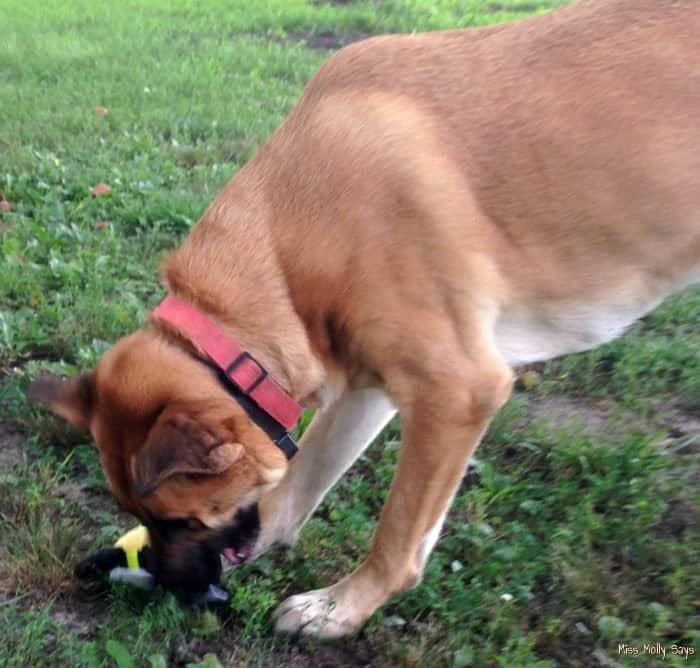 Meanwhile, Brandi grabbed the crinkly BumbleBee Silly Bum. She loves squeaky toys! It held her attention for a while. But then, she spotted the bright red bee-hived shaped Dog Pyrmaid. She didn’t care that I hadn’t had time to put any treats inside, she wanted it just to throw around chase! 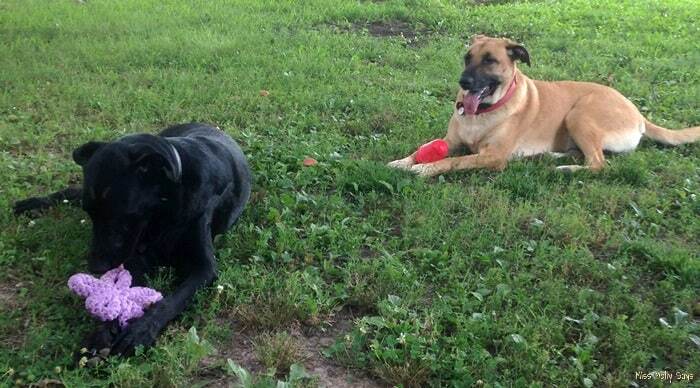 As you can tell, the pups (and I have still call them that even at 2 years old) are the ones that love to play. They ran, tugged, wanted me to throw the toys some more just so they could fetch, and then ran and tugged some more. The older dogs joined in from time to time and it was a race to see who could fetch it the fastest. Finally, they settled in the grass for a break and it was time for me to get their garden themed treat menu ready. The older dogs knew there were more goodies in the BarkBox and they had been hanging close to it. They were happy when the pups decided to take a break and I broke out the party menu! 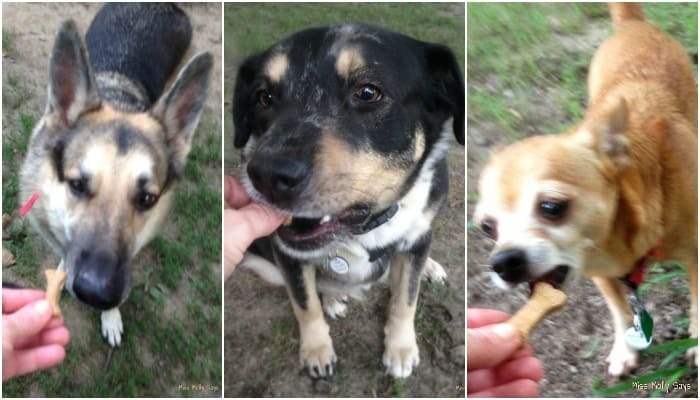 For our garden party menu, BarkBox had sent Hare of the Dog Rabbit Biscuits, rabbit, red apple and dandelions! Wow! Did you know dandelions could be used this way? Actually, the word rabbit perked all their ears up! There was also some Pure Power Superfood Protein Dog Treats, an Etta Says Turkey Chew and a Turbopup Complete K9 Meal Bar. That was some menu lineup! No wonder the older wiser ones had stayed close to the party table! We spent a little more time playing fetch and then it was time to take these tired, but happy dogs in for a good long nap. While we LOVED all the items of the BarkBox, if your pup doesn’t like one of the products, no problem! They will replace the damaged/disliked with no fuss, just email their Happy team (happy@barkbox.com) and they’ll fetch a better item for your pup! We had a great time for our party afternoon! Just getting the box was like Christmas, with all the new toys and treats. We turned it into a fun afternoon of trying everything out, playing, eating, spending time together and having good old fashion fun! I love that BarkBox ships a box each month full of pawsome toys and treats that you’re not likely to find in any old pet store. It’s delivered right to your doorstep! With all the fun we had, I bet the pups will take it off the delivery truck when the next BarkBox comes, never mind waiting at the door! Why not make a monthly ritual for you and your pets? I enjoyed my day as much as my dogs did, just watching them have so much fun with their new toys and treats and loving all the extra attention! It’s a great way to bond with your pups. After all, life is short! Make a playdate each month with your pet and BarkBox is the perfect way to go for all the fixin’s! Get started today with this special Discount Code for 10% off your first box plus free shipping! The idea of subscription boxes for dogs is pretty neat! The dogs obviously loved it, too! Looks like a Goody Grab Bag for all Doggies!!!! LOVE IT!!! My son and daughter-in-law have 2 dogs – they do not yet subscribe to BarkBox, but I know that they have talked about it. I will be sharing this discount code with them! We haven’t had a dog in many years (We rent.) But our last dog would have gone nuts for this! Wow! Looks like a wonderful box that my mom’s dogs would love. I love that they tend to come with both toys and treats for the pups. Do not have a dog.Have a Maine Coone Tuxedo cat cat born 17/12/2001! How fun to get one of these every month! My dogs (and I) would love it! The box was filled with a lot of doggie goodies. It is nice to see that others like to do nice things for our furry friends! After all, their love is unconditional! I like that they’ll replace any item that your pet doesn’t like – no fuss!! 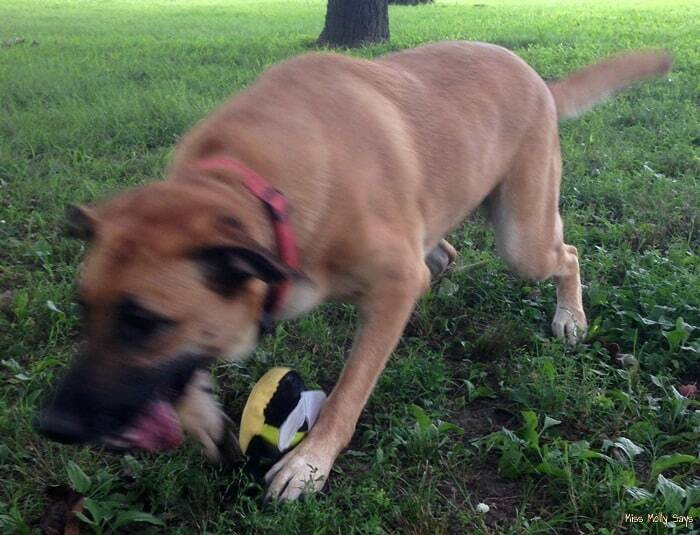 what a great way to encourage pets and their owners to play together! I have never tried a Bark Box. I am just not sure if my dog would like everything in it. Sounds like your pups really enjoyed everything. This is something I’m sure our dogs would love too. They just love getting things in the mail and light up when they do. Sounds like they included a lot of great products. My dog would really love this subscription box! How fun! My pooch would love Barkbox! It looks like they loved everything. That was such a nice box of goodies. It looks like this box has a lot of great things for dogs. I like that it has treats and toys in it. I have two cats- is it possible to buy a Meow Box someplace? My dog would love this. She waits for the mailman each day, and I always tell her “there’s nothing there for you.” She’d be thrilled to get a package from the mailman! Sounds like you get a great box full. I’ve been thinking about getting it for my pups I think they’d love it! I would love the for my dog, have to tell my friends about it. Makes me wish I still had a dog. Yours really liked the barkbox. This is a cute idea. Doggies might actually grow to like the UPS guys, lol. my dog loves to get mail. He smells everything we get. Aww, all your pups look like they enjoyed their garden themed box. Looks like there was something for each type of dog to play with and to taste! I’ve heard a lot about Barkbox, but never really looked into it. I really like that if your dog doesn’t like one of the toys, they’ll replace it. That’s so important, as I know I’ve received toys that I don’t let my dog play with or were of no interest to him in other boxes that are similar. Looks like the fur babies LOVED the party! Super cute pups! This box seems like you get your monies worth! We’ve been getting Barkbox for 2-3 years now, and our dogs absolutely love it! They get so excited when we walk through the door with the box, and we love the variety of toys and treats. Lol, it looks like the pups definitely enjoyed their box. This would be great fun for anyone with dogs! Bark Box sounds like a wonderful subscription box to get for your dog, because let’s face it they are family. I would definitely get a Bark Box subscription if I had a dog, or I would give it as a gift. Thank you for sharing this review. We just adopted a second dog. This would be awesome to get every month! This sounds quite interesting! A great treat for your pets! I hope it was enjoyed by all. I have cat’s do they have one for cat’s? The BarkBox looks like it has some interesting toys and treats. My guys would go nuts over these boxes. Your dogs are so pretty. I miss my dog. I love the photos. It makes me miss my pups! Time to get another pup. It’s nice to treat the pets once in a while, lol. They obviously loved it! I keep considering this for my 2. I’ve gotten some of the nerdy subscription boxes for myself and really liked them. Going to have to try one for the dogs, sure they will get a kick out of it. Bark Box looks like something most dogs would love. I say most because my dog doesn’t like to play. She enjoys chasing the birds for fun, other then that she just loves to be loved. You have one for cats? 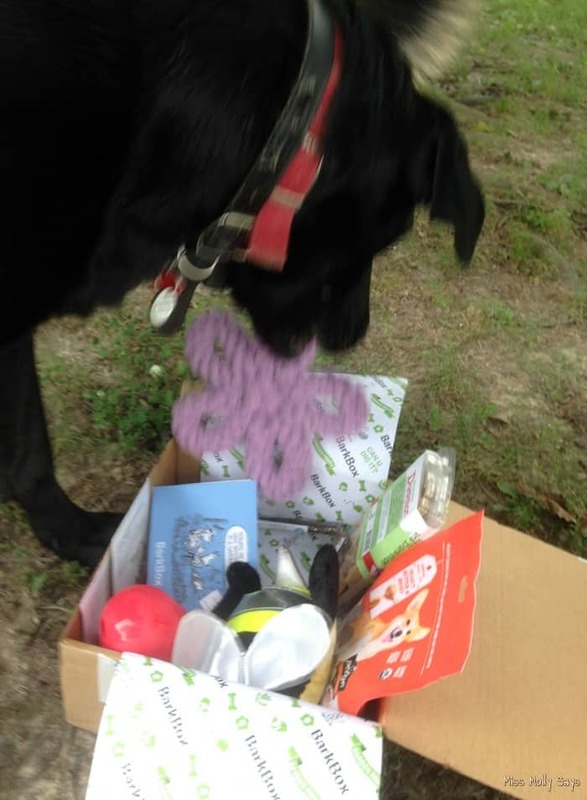 A monthly delivery of toys and treats for your dogs is a nice idea. Thank you for sharing this review. THIS BARK BOX IS SUCH A GREAT IDEA. A subscription box for pets is such a charming idea. A lot of people would appreciate this. I have a pug, shepherd mix, German Shepherd, and Boston terrier mix. They would all LOVE a bark box. I’m amazed at how interested the dogs are in the box. They somehow know all the stuff is for them. Barkbox looks like they have covered all the bases for dogs. Do they have a MeowBox for cats?? Wow, wow, a thousand times WOW! Judging by the adorable blurriness of the photos of the photos alone, it’s obvious to me that this was a big hit. And it sounds like BarkBox has great customer service (e.g., in their returns policy), and really understands what dogs and their humans need and love!